Does this make you feel a little overwhelmed? Maybe your thinking, “Are you kidding me, Brittany? I don’t have time to spring clean!” Now now. Don’t worry! 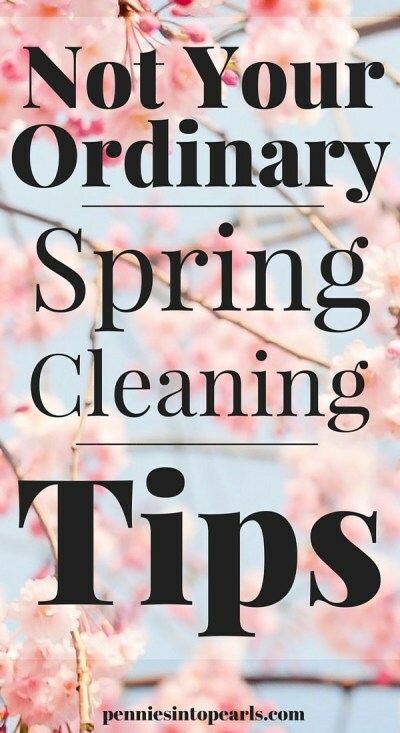 I have brought together seven super helpful spring cleaning tips that are not only going to help streamline this process to save you time, but these tips are going to help get your family motivated and excited to lend their helping hands! Number one on my spring cleaning tips list is to round up all of your main cleaning supplies and plop them into something that is easy to tote around. This is going to save you several trips back and forth across your house searching for cleaning supplies. Tip: I love to keep an old toothbrush in my cleaning tote. This is the perfect cleaning accessory to get in any small corner! A shower caddy is a really great option. Another place to find cheap carriers would be the Dollar Tree. Anything with a good amount of space and a handle will work great! 2. Dollar Tree Cleaning Supplies Work! Have you noticed how much I am a little obsessed with the Dollar Tree lately? I recently did a review on five different cleaning supplies you can find at this awesome store. You can check out that article right here. Make sure to go check out that article to see which cleaning supplies are more than worth the buck spent and which ones you need to pass on. 3. Turn the Music Up! It’s amazing the things I can get the kids to help with if I turn on the music. By doing this simple step the mood in the entire home is brighten instantly! So pass out a few dusters and turn up the music! See the magic unfold! I am betting that you will be surprised on how the level of whining goes down. Don’t get crazy and start thinking you are going to attach your entire house in one day. Setting a goal like that is going to leave you very tired and unaccomplished. Keep it realistic. Choose one room or task (baseboards, kitchen, toys) at a time. Break the big jobs down into small assignments for the little helpers at your house. Take that a step further and make the jobs a friendly competition. Seeing who can dust the baseboards the fastest will get the job done with minimal resistance from “volunteers”. When using this spring cleaning tip you probably don’t want to use jobs that need more of a thorough application. When doing jobs like cleaning the toilet, you are going to want to be sure that the job is done well. We aren’t trying to win any spring cleaning contests over here! Make sure and give yourself a break. Set small goals for yourself. Like once you finish cleaning the walls then you get a 10 minute break. This is important. Set a timer for your breaks! If you don’t, it’s going to be really easy to stay on the couch a little too long. Before you know it, it’s dinner time and your window of opportunity to clean is closed! While we are on the subject of taking a break, snack time is another spring cleaning tip that is sure to help motivate the fam. Using the same goal setting method as before, tell everyone that once they complete a set assignment then they will get a treat! Make it a good snack to be sure and keep everyone’s interest in hand! I hope you enjoyed these spring cleaning tips and let me know if you enjoyed the video!